Your marriage, in all its details, is intimately connected to God. This is the major thesis of Winston Smith’s fantastic book on marriage. He sees that the most important part of your marriage is your relationship to God. All the mundane, frustrating, and even difficult moments of marriage are moments to experience God’s extraordinary love. Marriage Matters is a helpful resource for couples that invites them to look beyond themselves and their expectations for their marriage. The book is broken down into three sections. The first section focuses on foundations, laying a theological grounding for a godly marriage: namely God himself. The first five chapters discuss God’s love as the foundation for our own. Smith helps us to see how a focus on having a specific kind of marriage, or a specific kind of spouse can actually become an idol. Changing our marriages requires us to change ourselves, gaining a new perspective. He connects our difficulties in loving others with loving God. Our marital problems often stem from worship problems. Here Smith defines love biblically, helps us to see how God connects to the ordinary and frustrating moments of marriage, and clarifies what our goal in marriage should be. It’s a crucial and foundational chapter in the book. 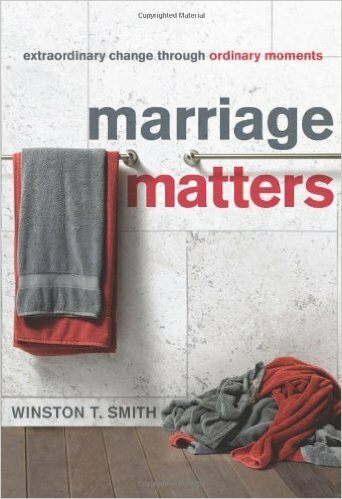 While many books deal with these issues, Smith’s emphasis on the divergence between God’s goal and our goals in marriage makes this a unique contribution. Section two turns to the practical application of biblical truths in the ordinary moments of marriage. Here he deals with a number of issues that are common to marriage, but he deals with them in some unique detail. He covers topics like manipulation, honesty, conflict, forgiveness, roles, and sexual intimacy. Single chapters cover each topic. Smith’s chapter on manipulation is a particularly helpful chapter that too frequently gets overlooked in basic marriage manuals. The problem is so prolific and common that it is surprising more introductory marriage works don’t discuss it. Smith takes it head on and deals with it a very helpful, practical, and Biblical way. This chapter is worth the price of the book. Section three gives guidance for endurance in the ordinary moments of marriage. Smith walks us through the power of grace, especially when wronged, the importance of patience, the significance of hope, and the truth of our own story (apart from marriage). Change does not happen over night, it takes time and so Smith helps us to prepare for the long haul. This too seems a unique series of chapters in a basic work on marriage. Most marriage books prescribe a simple strategy for change that ignores the contexts in which change has to take place. Smith knows we need to anticipate slow progress and realistic expectations. Smith is sensitive to the unique and common challenges of marriage and he writes a monograph that contains chapters you won’t find in most other introductory works. This is one of the best books on marriage I have read. Smith focuses on helping individual spouses grow and change, and particularly grow in their relationship with Jesus. The idea is that godly marriages are all about godly spouses, and Smith knows that and makes that their emphasis of his work. This is a welcome volume to any counselor’s collection, but more than that, it is a great addition to the personal library of Christian married couple. I highly recommend Marriage Matters.